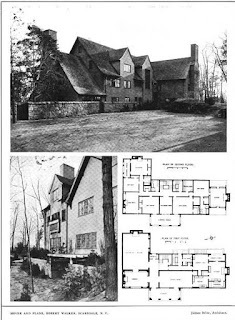 'Fourway Lodge', the Roberts Walker residence designed by James Brite c. 1915 in Scarsdale, New York. Walker, an attorney, was a member of the firm of White & Case. It is unknown if the house is extant. Photo from Architecture, 1916. Walker died suddenly on December 22, 1926 and his widow Edna Morse Walker was left with a tidy fortune. Per the publish records of the day the value was $273,769. Per an article from the Scarsdale Inquirer (1926): "In 1904, he married Miss Edna Morse, daughter of Mrs. Henry Waters who now makes her home on Old Army Road, Scarsdale." I did a quick Bing Map search but couldn't match up anything. Their oldest child ("Bunny") passed away in 2004 at the age of 100. I see that Walker was criticized for being 'often absent' from the Pecora commission, in New York, or 'at is home in Scarsdale'. Not really enough to own that house in today's world. How things have changed.